Warm winds are regularly now bringing in temperatures of 50 degrees (F) in early March here in Northern Wisconsin. It's time to face the fact that we really are not going to have a winter, after all. And we are not alone; everyone else in the lower 48 seems to be faced with the same conclusion. 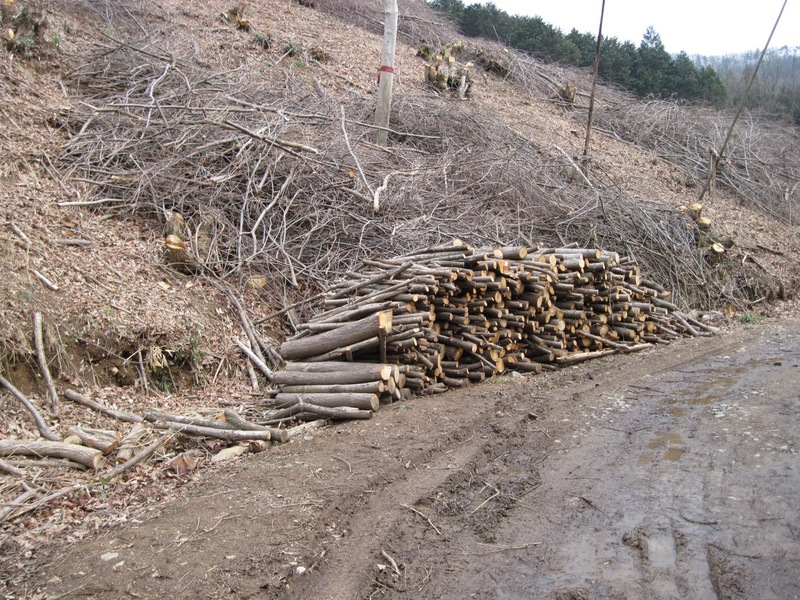 With the warm wind comes confusion … and panic over log cutting times and inoculation dates. Shiitake logs waiting to be picked up. Conflicting information abounds about when to cut wood for Shiitake cultivation and how long you can let it sit around before it has to be inoculated. The standard advice: cut the trees when dormant, inoculate by the time hot weather arrives (or as the Japanese say, by cherry blossom time). Should be simple, right? Sure enough though, we’ve heard everything from aging the wood 6 months to getting wood inoculated within 3 days, or no later than two weeks after felling or as soon as possible after felling. And the list goes on and on. And of course there are nuances ... softer woods should be inoculated as soon as possible, as should summer cut wood. But that’s a subject for another blog post! As with life in general, there is the "Best Practices" category and then there is the "Do Our Best" category. At F&FP, we definitely find ourselves in the latter category when it comes to log inoculation. 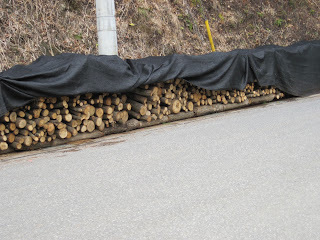 These logs, restacked from a forestry site, are awaiting inoculation. DO cut the trees while dormant. This is the period where water in the inner bark is low, insuring tight bark retention for the life of the log, and the amount of carbohydrates is high. Bud swell is a visual indication of dormancy breaking. To the unpracticed eyes, dormancy means no leaves, even itty bitty ones. In fact it means little green in the buds at all; the buds being tight. 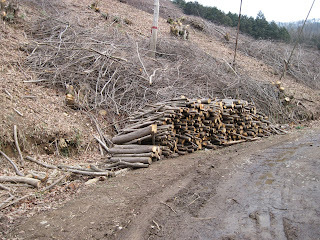 DO let the wood age or "cure"… at least 2 weeks if possible. Though inoculating immediately after cutting the wood will not kill the spawn, it may not “invite” hyphal growth for a time period, so in essence spawn becomes a “sitting duck” for awhile. If spawn sites, sawdust spawn in particular, are not properly sealed, there is a risk of it drying out if the logs are subject to wind and warmth before growth commences. Inoculation between 2-4 weeks of felling is probably ideal but picking the "perfect time" will depend on weather, geographic location, wood species, location of the tree and location of wood ON the tree, diameter and bark thickness and where and how the wood is cured. DON’T let the wood dry out. How much curing time is determined by the rate of drying. Here is where you have some control … if you want to inoculate very soon after felling, stack the logs loosely with lots of air space (but still keep them out of direct sun where the bark may get excessively hot, causing some disease problems and uneven drying).On the other hand, wood cut in the dormant period can wait for months to inoculate after felling if they dry slowly, such as in cold, snow covered locations. If you are concerned that wood cut very early in the dormant season (such as fall) is too dry (after months of cool weather laying in the woods), take a moisture sample. Optimal moisture content in bed logs is 40-45 % moisture, but growth is possible from 20-47%. If it is going to be a month or more before you inoculate your wood from the date of felling, bulk stack the wood in a protected area away from direct sun to slow the drying and keep the bark cool. Bottom Line, for best results, get your wood cut now, but don’t let the hurry of and early spring allow for poor choice of tree selection in the woods; fall is only a few months away and is also a great time for inoculation! Once you’ve procured your wood, relax and then schedule your inoculation. Have a few tarps or another porous material such as pine or cedar boughs handy to cover the logs and prepare a protected place to stack your logs while you get everything else together. What if you can't inoculate your logs in a timely fashion? When is the wood too dry? Do I soak the logs in water before I inoculate? If you know its going to be at least a month after felling the wood before inoculation, bulk stack the wood in a shaded, protected location. If weather is warm, dry and windy for several weeks, water the logs for 1-2 hours at least weekly and loosely cover. You can generally gauge the curing progress of the wood by checking the cracks at the end of the logs. Cracks begin from the center of the wood and move outward; fine cracks reaching halfway from center to the the bark indicate that the inoculation conditions are about right. If the cracks are large (you can slide a dime into the largest cracks), consider soaking the logs 24-36 hours and letting them dry a day before inoculation. Overall, tree selection, timing of cut, log storage and timing inoculation is almost just as much of an art as it is a science. Our goal at Field and Forest Products is to provide people with information so they can make the best possible decisions when it comes to growing mushrooms. Welcome to the official blog of Field & Forest Products. For those of you who are unfamiliar with our company; we have been in the mushroom business for 35 years. As a mail-order business, we cultivate and sell organic mushrooms and mushroom spawn. Located in Northeastern Wisconsin, our small family owned business is constantly growing. This blog was created with the hope that people get to know not only the business, but also the people behind it.